The roles of the British Army's special forces unit, the 22nd Special Air Service, include counter-terrorism and reconnaissance. 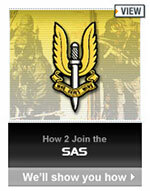 The SAS is one of the world's most renowned and respected special forces regiments. The SBS is the Royal Navy's special forces unit. Whilst experts in Maritime Counter-Terrorism (MCT) and amphibious warfare, they also operate on dry land. Since its inception during World War 2, the SBS has been a first class naval special operations force. The SRR was recently formed to gather intelligence & carry out surveillance operations in the war on terrorism. Members of the SRR are recruited from throughout the UK military. The SRR is the only UK special forces unit to recruit women. Like the SRR, the Special Forces Support Group is a recent edition to UKSF. The role of the SFSG is to give combat support to SAS & SBS operations. One of the UK's recently added special forces units, 18 (UKSF) Regiment provides communications, and SIGINT support for other UKSF regiments. The Paras are the UK's airborne shock troops, tasked with flying into enemy territory and capturing strategic positions. Many soldiers from the Parachute Regiment go on to join the Special Air Service. 16 Air Assault Brigade's elite reconnaissance unit, the Pathfinders operate behind enemy lines and are experts in high altitude parachuting. The Royal Marines are an elite amphibious raiding force, tasked with attacking from the sea, coming into shore in boats or helicopters. Royal Marines Commandos pride themselves on their fitness and tactical ability. The elite of the RAF, Army Air Corps and Royal Navy Fleet Air Arm, these specially trained pilots and aircrew insert and extract special forces teams, often operating deep inside enemy territory. Flying modified Chinooks HC2 helicopters, C130s, Lynx AH7s, Seakings and Agusta A109s, these special forces flights provide UKSF with vital support. Highly trained spotters tasked with inserting behind enemy lines and calling in accurate artillery fire from artillery batteries. The elite ground troops of the Royal Air Force. RAF Gunners make up part of the Special Forces Support Group. The role of Britain's special forces, such as the Special Air Service, has transformed over the years; from defeating Hitler, to facing down the Soviet Union, to their current preoccupation : fighting the global war against terrorism. New British special forces regiments have been formed to assist in 'the long war', as it's sometimes called. Governments around the world are putting more stock in the need for special forces : small, well trained and supported units operating on battlefields where the battle lines are poorly defined with enemies mixed amongst friends. The United Kingdom has recently added several new special forces units to its ranks, (the SRR & the SFSG), as well as bolstering the existing units (the SAS & the SBS), a move that signals a willingness to engage in the asymmetric warfare of the 21st century. Special forces are sometimes referred to as 'force multipliers' - a recognition that these small teams of operators can achieve results comparable with much larger forces; whether by integrated with their own military or by training and operating alongside foreign forces. In Afghanistan, 2001, US special forces worked closely with Northern Alliance troops, coordinating attacks and calling in coalition air strikes. By employing SF in this way, the coalition was able to oust the Taliban with the minimum of ground troops whilst fostering a positive relationship with the indigenous friendly forces.